Sure, I wasn't at the SF Giants opening day game yesterday (insert sad face) but, I was there in spirit. I likely won't be able to attend some baseball games for a good chunk of time but as the saying goes, absence makes the heart grow fonder. I'll be able to enjoy those garlic fries soon enough...and even an alcoholic beverage by the time I return! You looks so comfy and cute! I love the hat-bag combo. You are glowing darling :). You look amazing and so darn comfy. I love a cool, casual, and comfy look. Amazing photos. Great outfit. It creates a summery cool mood! The bag is just awesome! Thanks for sharing. 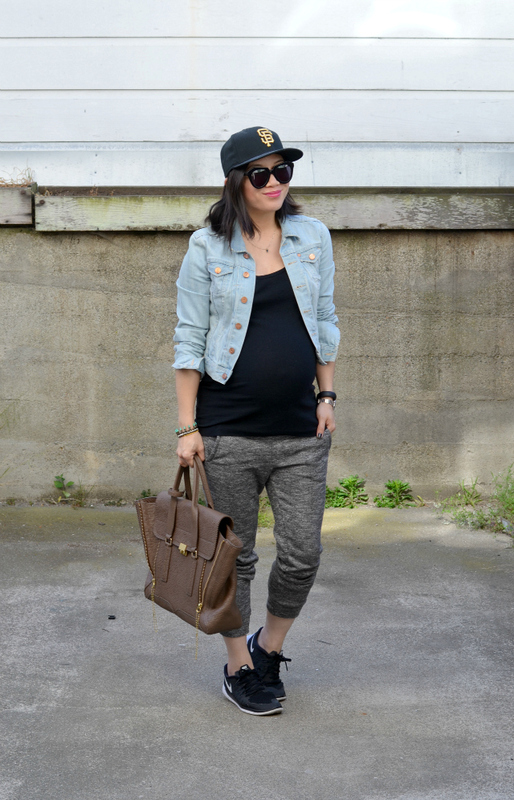 cool and comfy look! Hope you had fun! Waow, I really love your look! those pants are amazing! such a darling look! love the sunglasses! Even if you can't go to the games any time soon, it's definitely worth it ;) Love the comfy, chic look you're sporting here. You've inspired me to pull on my Yankees cap! Love this sporty look! Your sweatpants look so comfortable. I've been meaning to get some, but haven't found the right pair yet. I love your outfit, you rockin being pregnant with that outfit! have a great day! Cute outfit! Love that bag. I have it in black and need to break it out more often. Love the sporty look, Nancy! Wish I had been able to attend a Giants game when I was in SF last week, but I did get to go to a Warriors game! My facebook and IG was filled with people writing about the Giants opening day. 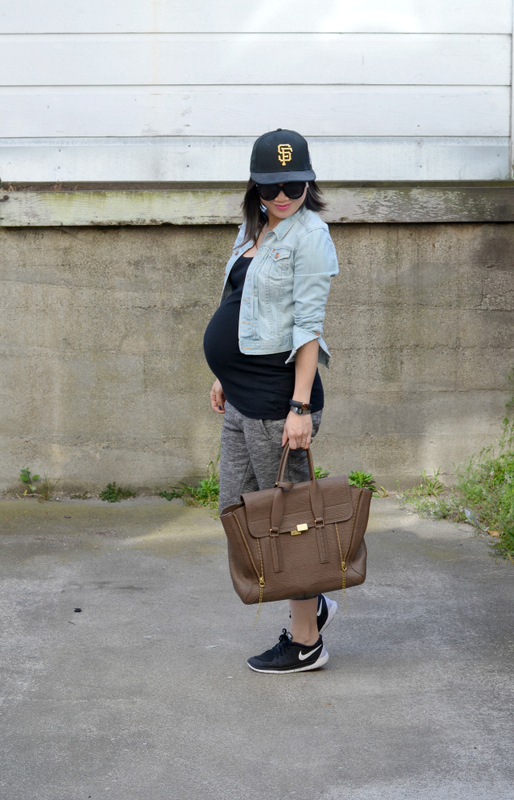 Such a cute sporty look! HaHa Nancy! I know you love baseball. Your outfit is too cute! Love this casual outfit. My gf was at the game and had a great time. My son is playing baseball and I had to volunteer at the snack bar last night for 4 hours and I was so exhausted after my shift. I am sort of done with baseball (at least little league). 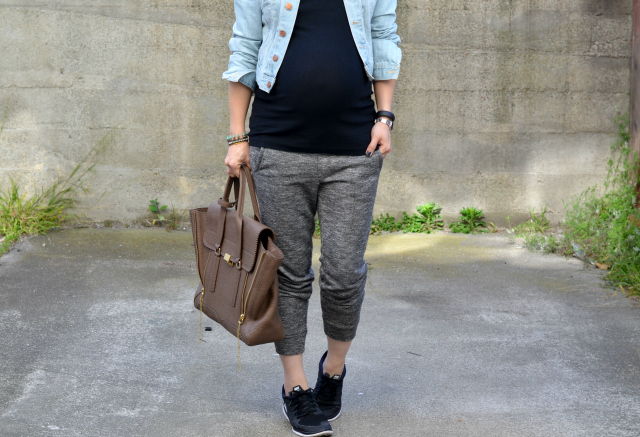 What a cute casual, sporty look! Sorry you missed out on the game.